Lowe's Ignites Controversy By Pulling Ads From 'All-American Muslim' : The Two-Way "We managed to step into a hotly contested debate," Lowe's says, and the company wants to "defer to communities, individuals and groups to discuss and consider such issues." Criticized for running the ads, it's now being criticized for pulling them. A Lowe's store in Saugus, Mass. 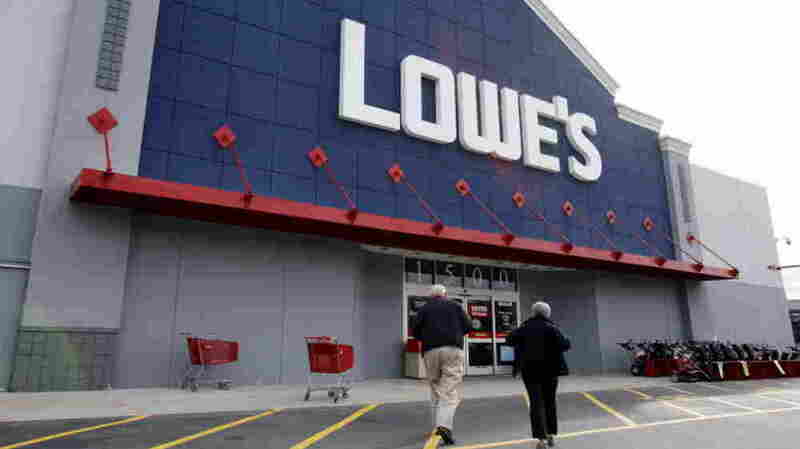 By deciding to stop advertising during the TLC network's All-American Muslim reality TV show after hearing that some conservatives object to the program, Lowe's Home Improvement is now hearing complaints from others who accuse it of religious bigotry. California State Sen. Ted Lieu (D), The Associated Press says, may call for a boycott of the home improvement chain. "It appears that we managed to step into a hotly contested debate with strong views from virtually every angle and perspective — social, political and otherwise — and we've managed to make some people very unhappy. We are sincerely sorry. We have a strong commitment to diversity and inclusion, across our workforce and our customers, and we're proud of that longstanding commitment. "Lowe's has received a significant amount of communication on this program, from every perspective possible. Individuals and groups have strong political and societal views on this topic, and this program became a lighting rod for many of those views. As a result we did pull our advertising on this program. We believe it is best to respectfully defer to communities, individuals and groups to discuss and consider such issues of importance. "We strongly support and respect the right of our customers, the community at large, and our employees to have different views. If we have made anyone question that commitment, we apologize." TLC says the show "follows the daily lives of five American Muslim families in Dearborn, Michigan, one of the most established and largest concentrations of American Muslims in the country and home to the largest mosque in the United States." -- The Zabans — Dad is a high school football coach, mom is a part-time secretary and they have four children. -- The Jaafars — Mike is "deputy chief at the sheriff's office." Angela is "an automotive marketing coordinator." They have four children. -- The Bazzy-Aliahmads — Nina, the mom, is "an ambitious businesswoman." -- The Aoudes — "Newlyweds expecting their first baby." -- The Amens — "Pillars in Dearborn." But the conservative Florida Family Association, which organized an email campaign aimed at Lowe's to urge it to drop the adds, says the show is "propaganda that riskily hides the Islamic agenda's clear and present danger to American liberties and traditional values." From what you've seen, heard or read about Lowe's decision, what do you think?